Runners take part in last year’s chamber 5K event. When fitness consultant Meghan Buser started running about eight years ago, she hated it. Always into fitness and finding ways to be active, she was slowly introduced to the sport when she started training moms at local parks. “One of the girls in my group was a huge runner. She said to me, ‘Let’s get into running.’ And it was awful. I was never a runner. And then the more I did it, the more I used to get peace and quiet,” she recalled. From there she ran a half marathon and started running competitively. It was an outlet for her as a mother and a way to mingle with other runners in the community. Wellington, a very active community, has its fair share of running opportunities and events throughout the year. 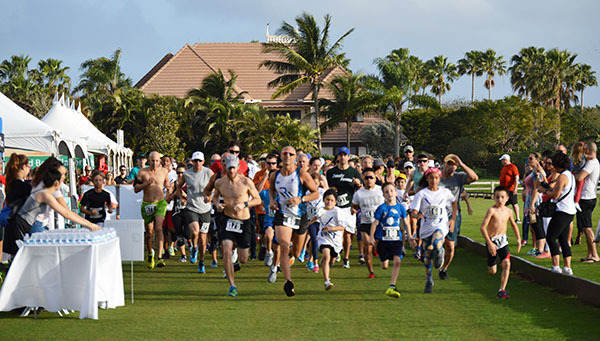 For the past four years, the Health & Wellness Committee of the Wellington Chamber of Commerce has hosted the Meet Me at the Race Sunset Stride 5K in an effort to promote local health and wellness opportunities available for residents right in their backyard. This year, the 5K run will take place Saturday, March 2 at 4 p.m. at the Wellington National Golf Club. Between 600 and 700 participants are expected. “I love health and wellness in our area, which is why I joined the committee,” said Buser, who also plans to run this year. Buser is active in the chamber through her position as the Live360 community liaison for the Mall at Wellington Green. Lisa Banionis, event chair for the past four years, had similar motivations. The owner of two medical practices in the community — one focused on interventional pain management and the other on anti-aging — Banionis said that health and wellness are making strides in the area to the benefit of Wellington residents. This is something the chamber wants to promote, teaming up with local hospitals, fitness studios and more for the March 2 event. “It’s a way we thought of getting people out there to do something healthy and fun as a family, and a great way to showcase some of the amazing health and wellness businesses in Wellington,” Banionis said. The event will feature about 20 local health and wellness exhibitors, music and demonstrations. The committee paid special attention to recruiting vendors in the holistic portion of the industry. Another chamber goal is to get families out to experience the community and participate in something fun together. Each year, the race takes place at a different location. Last year, the race course circled polo fields, and this year the race takes place in a golf course setting. The race is scheduled for a Saturday afternoon, as opposed to last year’s Sunday morning time slot, to increase participation and brand the event as an enjoyable family outing. “We did that because we don’t want to compete with sporting events and other races,” Buser explained. A barbecue is planned for after the race. The registration cost is $10 for children ages six to 11. If children are not quite ready to commit to the 5K, the event features a one-mile dash, which is free. The race is structured conventionally with winners and medals for various age groups and genders. Titles such as “Biggest Tribe,” “Biggest Professional Group” and “Wackiest Dressed” are also available to be nabbed. To register for the event, visit www.active.com and search for “Meet Me at the Race Sunset Stride 5K.” Registration is $25. Onsite registration begins at 3 p.m. The race begins promptly at 4 p.m.
For additional information, call (561) 792-6525 or visit www.wellingtonchamber.com.